My sons have started tee-ball this year, and were excited to get their “jerseys”, which are one-size-does-NOT-fit-all t-shirts. My guys are pretty little, so the shirt fit something like a dress. I think a too-big t-shirt is cute and all, but wanted to size it down a bit so it fit better. It was pretty easy to do! 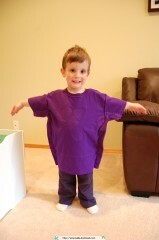 First, I got a t-shirt that fits him well, and turned it as well as the too-big t-shirt inside out. I laid out the too-big shirt with the fitting shirt on top, lined up at the collars and tops of the shoulders. I traced the fitting shirt onto the too-big shirt with a fabric marking pencil. I took the fitting shirt off and pinned along the marks, as those were my sewing lines and I didn’t want them to shift during sewing. 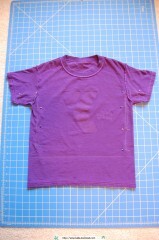 I did trace the bottom of the t-shirt, but that is NOT a sewing line – that’s going to guide me during hemming the shirt. I sewed along the white lines and then with the shirt still inside-out, had my son try it on to make sure I had the fit right. When I was confident it fit well, I trimmed off the excess fabric about 1/2″ from the seams. 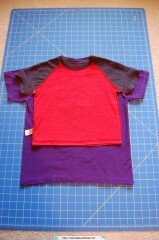 For the hem, I cut it about 1.5″ longer than my fitted t-shirt, to give me room to turn it under and stitch it. 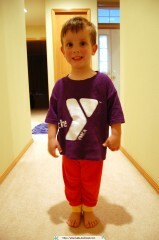 Once it was hemmed, all that was left was to put it on and enjoy! 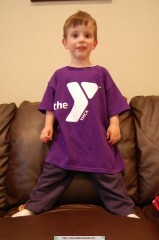 Here he is with a much better fitting shirt.